I never thought I would be going 3 weeks without a new post, especially since my wife and I have been doing a bit of travelling, the lack of updates is because we went back to Canada to visit family over the Christmas holidays. 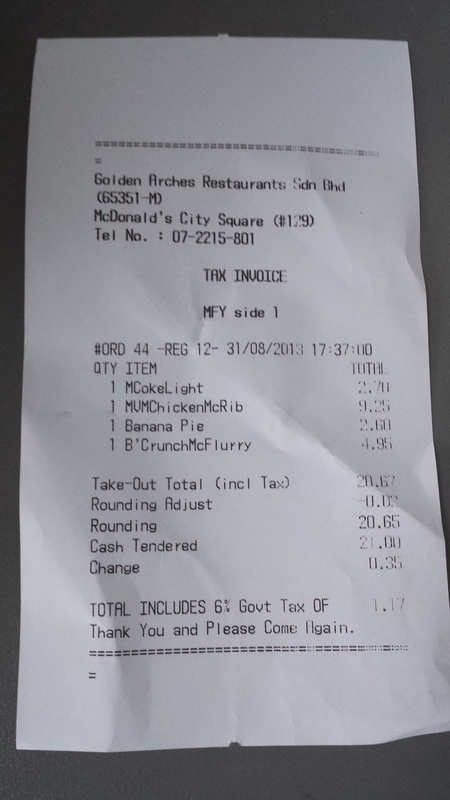 I haven't been home in about a year and a half, and though I tried a number of new McDonald's items, I had no time to write a single review. I've been back for a week now, and I really should have been doing some writing, but since my wife went to Korea to visit HER family, I've been using my alone time to catch up on some video games I haven't been able to play over the last couple months. 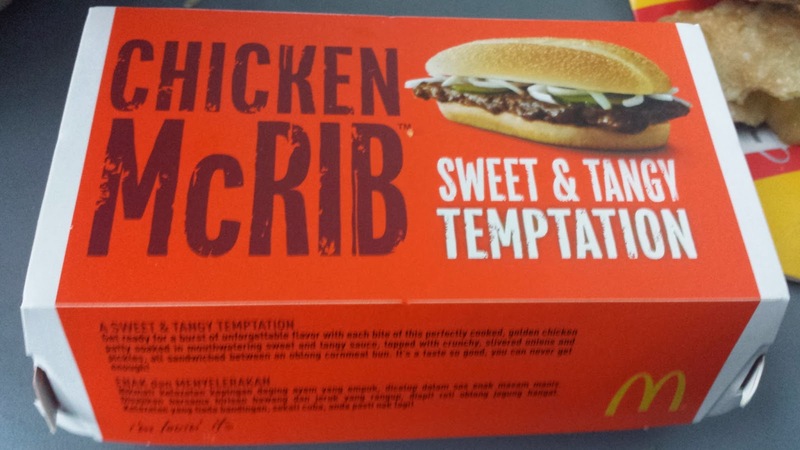 Now that I've caught up on sleep, and beat a couple games, I'm in the mood to write a couple reviews, the first of which is the Chicken McRib, a burger I had back in August when my wife travelled to Canada leaving me to go to Malaysia to try this on my own. 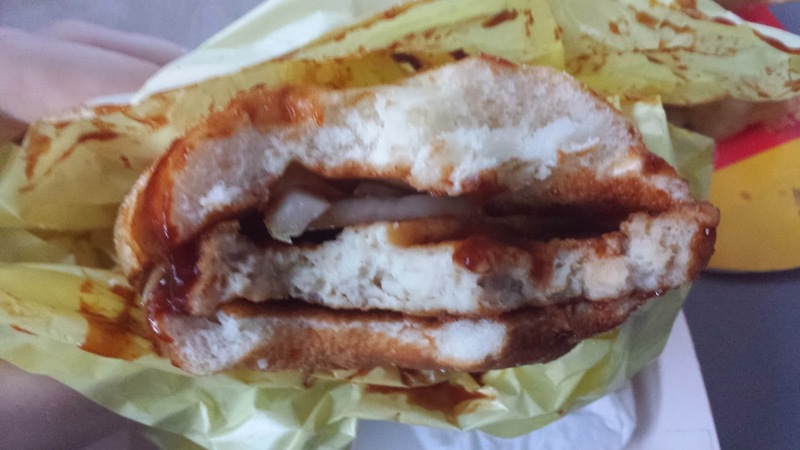 The McRib needs no introductions, but what may need an introduction is that this isn't your typical McRib, but I think this is the first, and only time it's been available in Chicken! 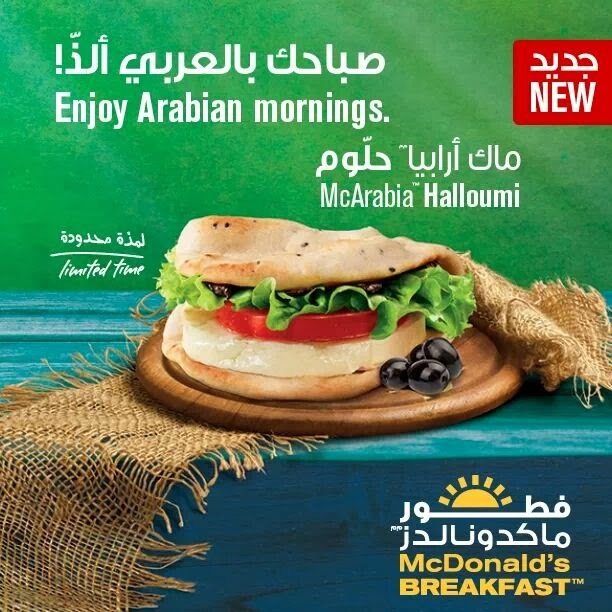 It's not all that strange since Malaysia is a islamic country, and you aren't going to find pork at their McDonald's, even the breakfast sausage served there (and even here in Singapore) is made from turkey or chicken. The name isn't even all that misleading! 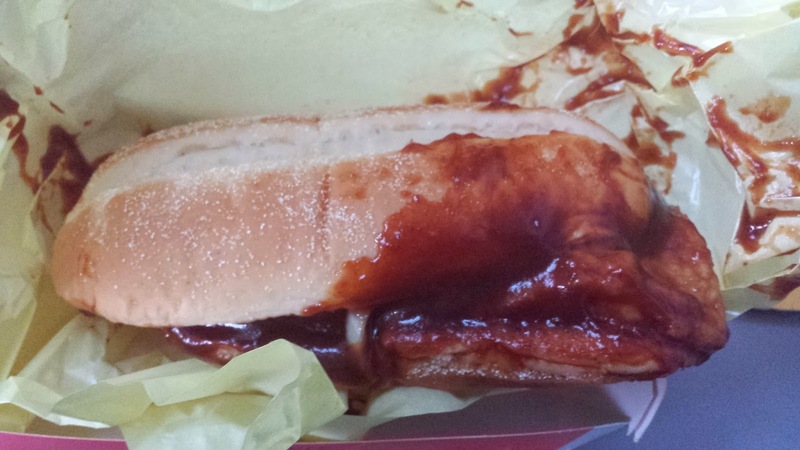 The pork based McRib thats appears from time to time in the US, doesn't use real rib meat, and neither did this sandwich. It's reminded me of one of my favourite Korean dishes "dakgalbi" which translates to Chicken Ribs, but as expected, even that dish contains no rib meat! 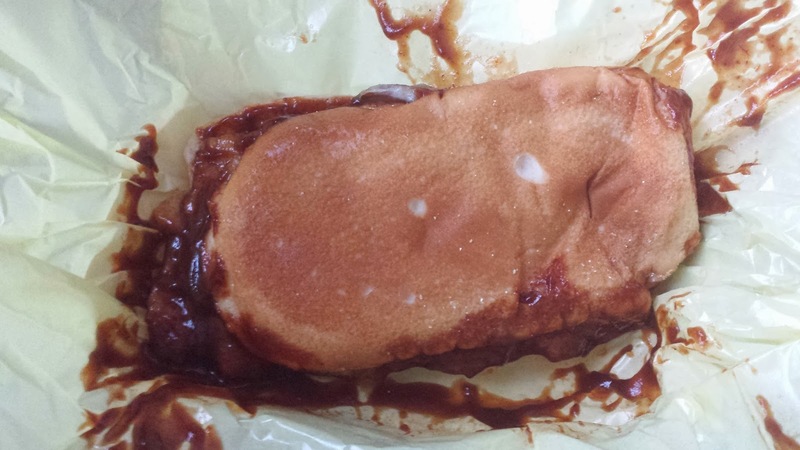 The meat was shaped exactly like the original pork version, including the fake rib marks in the patty. The patty was made mostly of breast meat, and though it was pressed, it wasn't as chewy as the pork ones I've had before. Though, this was easily the messiest McDonald's burger I've ever had. Just take a look at the photos and look a the amount of sauce on there. 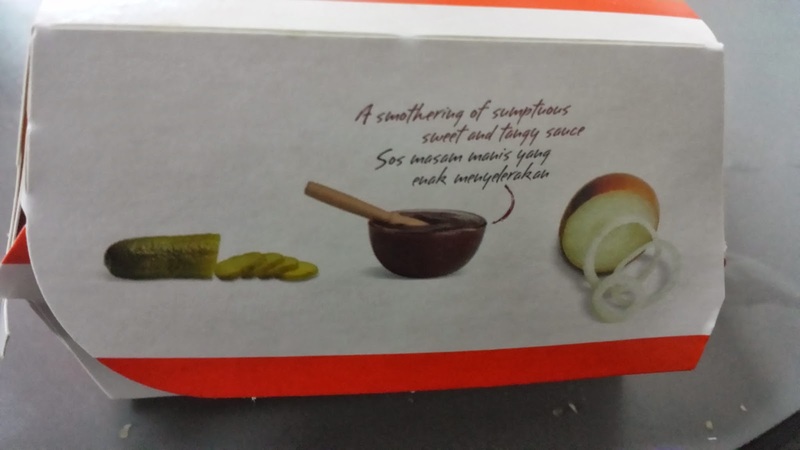 Even when I opened it, sauce had already spread from the patty to the top and bottom of the bun, sure this branch is always pretty busy, but some better care could have been taken. The sauce itself was spicier than the US/Canadian McRib sauce, and it had less of a smokey BBQ sauce flavour, and more of a tanginess that I couldn't put my finger exactly on what it was. It's something I enjoyed, and when my wife made it back to Singapore a couple weeks later, I even offered to go have it again it was something I liked that much. 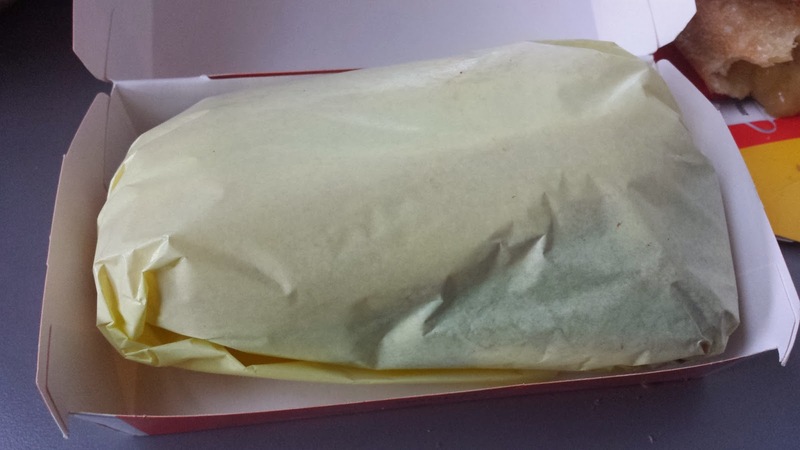 We never made it back to Malaysia in time for me to try it a second time, but if it ever does make it back, I'll be having it again...unlike the Prosperity Burger, which is now back in Singapore, at it's vastly overpriced $8 price-point, I've still yet to have one here at home. I missed this McHalloumi promo by 3 days in the Emirates in December. I was really looking forward to it too. Sadly, the promo that was running was the same one I had last December, the Grand Spicy Burger, so I gave it a pass.